Mayor Bloomberg’s war on smoking has been successful among almost all demographics since 2002, but hasn’t worked on the Asian community, especially men, the New York Times reports. While the percentage of white and black smokers fell about 8 percent each by 2010, the portion of Asian men who smoke has held steady at about 17 percent. 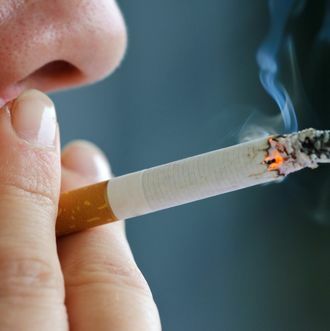 “It’s a largely accepted part of our culture,” says a Chinese-American Queens assemblywoman; the Times notes that in China and South Korea, some 70 percent of men smoke. About 5 percent of female Asian New Yorkers like to light up, compared to about 10 percent in China and South Korea. Still, the city sees smoking among the group as enough of an issue that this year’s campaign will include those gross anti-smoking ads in Chinese, as well as an ad campaign called “Pain” spread across Asian media. For their part, the Times manages to avoid all cultural stereotypes until the last line of the second-to-last paragraph, in which the reporter notices a smoker with a pack of cigarettes from China, with an English message on one side: “Quit smoking early is good for your health.” Well, it is.